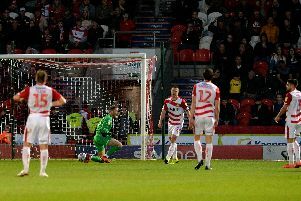 Performance is key for Darren Ferguson tonight as Doncaster Rovers host Nottingham Forest in the EFL Cup. Ferguson was disappointed was some aspects of Rovers’ opening day defeat at Accrington Stanley, particularly lapses in concentration which led to all three goals conceded. The Rovers boss has called on his players to show improvement as they look to pull off a shock against their visitors from the Championship tonight. “The key for me is getting a good performance and show we’ve learned from Saturday,” Ferguson said. “If you’ve got that, you’ve got half a chance. “We’ve got a cup match we’re capable of getting through. “We need a decent performance to give ourselves the best chance. Ferguson plans to make a handful of changes for tonight’s game and is likely to give game time to defender Joe Wright who missed the latter part of pre-season with a toe injury. Harry Middleton could start while Cedric Evina and Tyler Garratt will be pushing for a starting berth. Ferguson admits the cup is not his priority this season as he looks to secure promotion back to League One. But he is keen for his side to put on a good show in their first outing of the campaign at the Keepmoat. He said: “It’s not as much a priority as the league but it’s still a game we want to win. “Making three or four changes shouldn’t have a baring on that.